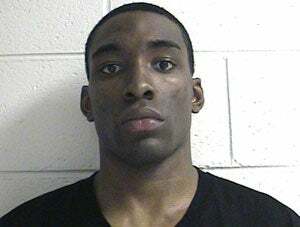 The East Tennessee State University men's basketball team has suspended Sheldon Cooley indefinitely after he was arrested earlier this week for filing a false police report. Cooley claimed $1300 in cash had been stolen from his room during a robbery where fellow ETSU teammates Adam Sollazzo and J.C. Ward were bound and gagged at gunpoint. Sollazzo and Ward (who lives in the apartment with Cooley) claim debit and credit cards were stolen along with a laptop. Police have determined that Cooley was never in possession of the $1300 and that he made the claim up. Cooley told police that the reason the criminals were able to get into the apartment was that he left his key/swipecard in the mailbox. "Cooley told police it was left there so his roommate would have access to the apartment due to locking himself out." This is also not the first time Ward has been the victim of a robbery. "Ward and another player's Atlantic Sun Conference championship rings were reported stolen from that same apartment this past fall." That case was never resolved. This most recent case is still being investigated and it presents a curious set of circumstances. Either Cooley thought he could scam an extra $1300 in cash—an amount every college student I ever knew had lying around in his apartment—out of the robbery of his apartment; or perhaps he was somehow involved—his roommate is targeted for the second time, his key is used to break in, he was not present and nothing of his was stolen—so maybe he made up the theft to make it look better. Why else file the bogus report? Regardless of motive, it was a colossally stupid move that now makes his suspension from the team the least of his worries.